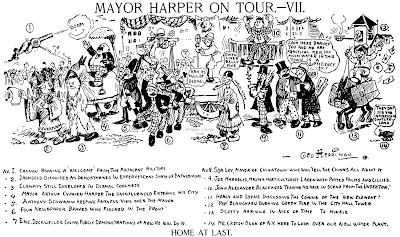 This Saturday we bid adieu to the Mayor Harper On Tour series. Unfortunately the final strip (4/26/07) doesn't measure up to the rest of this delightful series, this coda obviously dashed off in a hurry. After a short rest Herriman was put to work in earnest on the next big event in Los Angeles, a Shriner fiesta bringing fez-topped conventioneers from the four corners of the country. 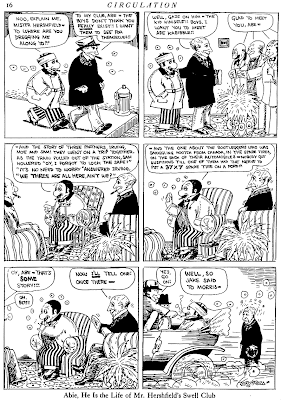 The Shriner's convention would be anticipated and commemorated by a flurry of Herrriman cartoons that will probably take us several Saturdays to work through. Today we have the cartoons of April 29 and May 1. The latter begins yet another previously undocumented Herriman series -- Preparations For Fiesta will run a scant three episodes. Shriner fiesta... Is that like the convention Laurel & Hardy snuck off to in 'Sons of the Desert'? Yes, exactly so! They all came to LA for some well-regulated drinking and carousing. H.E. 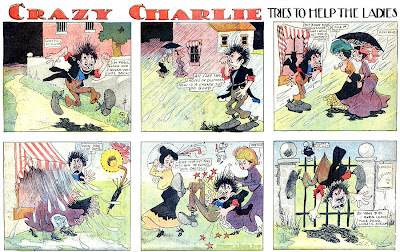 Godwin's cartoons were a staple in Philadelphia in the oughts, but the vast majority of his work was in the form of one-shots, gag cartoons and spot illustrations. It was only in the period 1902-04 that he contributed Sunday series to the Philadelphia Inquirer. 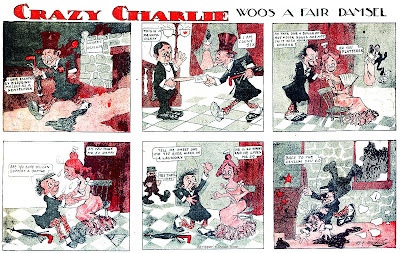 Of the half-dozen series he created, most lasted only a few months, and Crazy Charlie was no exception -- it ran from August 9 to December 13 1903. I cannot hope to describe this series better than Cole Johnson did when he sent me the scans of this rarity -- he termed it "a sensitive, gentle treatment of the mentally challenged." He also pointed out that the plot is practically a dead ringer for Milt Gross' much later Count Screwloose. A tip of my Napoleon bicorn to Cole for these samples. Milt Gross should sue Mr. Goldberg for such a blatant steal of his character, Count Screwloose from Toulouse. Oops. This is why I shouldn't write posts at 8 in the morning. 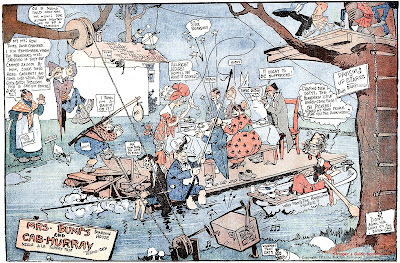 Tomorrow, Alex Raymond's classic Little Nemo! We are working on a post about H.E. Godwin's cartoons at an Ohio library. 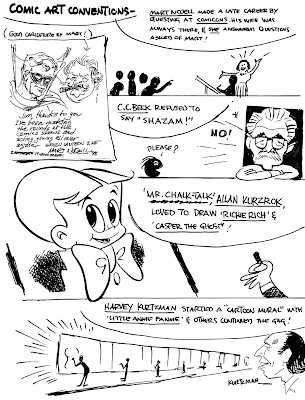 When we do run it, is it okay if we include a link to your post of Crazy Charlie cartoons? Thanks! We've already discussed the McClure Syndicate's acquisition of the talented and popular Dwig when we covered Uncle Jim, Tad and Tim; here's the other strip Dwig did for their Sunday section. 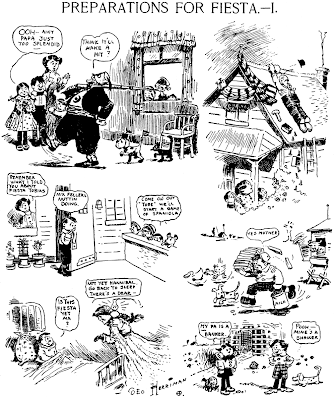 Mrs. Bumps Boarding House was vintage Dwig, echoing the classic School Days half-page panels he'd previously done for the New York World. The new feature substituted a bunch of oddball boarding house residents for the classroom kids, but the philosophy was precisely the same. Dwig's busy panels were the sort of feature you couldn't appreciate in a quick glance. They took a good bit of study to decode all the activity and the Rube Golberg devices, and in those days newspaper readers were willing to spend some time on a Sunday morning drinking in all the subplots and machinations that intertwined on these precisely constructed panels. Mrs. Bumps Boarding House began on January 12 1913, changed titles to Mrs. Bumps Cabaret on November 9 and ended on December 28. In the realm of syndicated features they just don't get much more obscure than this. Phil was distributed by the CV Newspaper Service. Not familiar with that outfit? Not surprising. The CV stands for Cornelius Vanderbilt IV. Corny was the Bohemian descendant of the shipping and railroad tycoon, one of the richest men in America. He rejected his family's staunchly conservative values and struck out on his own as a newspaperman. He started a small chain of papers in the early 1920s, a group of liberal muckraking tabloids in San Francisco, Los Angeles and Miami. The attractive tabloids were frozen out from newsstand and street corner distribution by the big players in those cities, and they barely managed to limp along for a few years. Vanderbilt had trouble securing the use of syndicated comics (he probably couldn't have afforded them anyway) so he created his own syndicate. The syndicate's features were offered generally, but I've never seen any of them appear outside the pages of Vanderbilt's own papers. Unfortunately the disdain for Vanderbilt's newspapers was even exhibited by libraries, and only his San Francisco paper even got microfilmed -- the papers are incredibly rare today and for all intents and purposes lost to history. The lighthearted, goofball adventures of Phil were penned by Charles Gordon Saxton. All I could find out about Saxton beyond this credit is that he wrote the scripts for a few minor Hollywood films in the late 1920s and early '30s, and that he did one of our mystery strips in the 1950s, a phantom feature called Mr. Skootch. 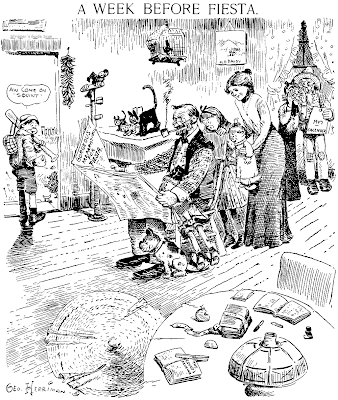 In the San Francisco Daily Herald, Phil ran from December 10 1923 to February 9 1924. It may have lasted a bit longer in Vanderbilt's other papers. Order Jim Ivey's retrospective book Cartoons I Liked at Lulu.com or order direct from Ivey and get the book autographed with a free original sketch.